This is the "Soundbites uit vervlogen tijden" (Sound bites from a bygone era) of the Meertens Institute, a research institute that study the diversity in language and culture in The Netherlands. The Soundbites collection includes sound recordings of conversations between dialect speakers from all parts of the Netherlands. The conversations are between two or more people, speaking more or less freely about topics of their own choice without interference from the researcher. The aim was to get a national coverage, so that a picture could be created of the spoken dialects of Dutch around the middle of the last century. The collection gives a unique image of a Netherlands that no longer exists. A special fragment, for example, is that of the extinct dialect of Emmeloord on the island of Schokland. The Emmeloorders were brought to the mainland in the nineteenth century because the government no longer wanted to defend their island against the water. Part of the population ended up in Kampen, where the recording was made in 1953 or 1954 (translated from original in Dutch from the KNWA and Meertens Institute website (*)). What part of the collection is included in the Media Suite? 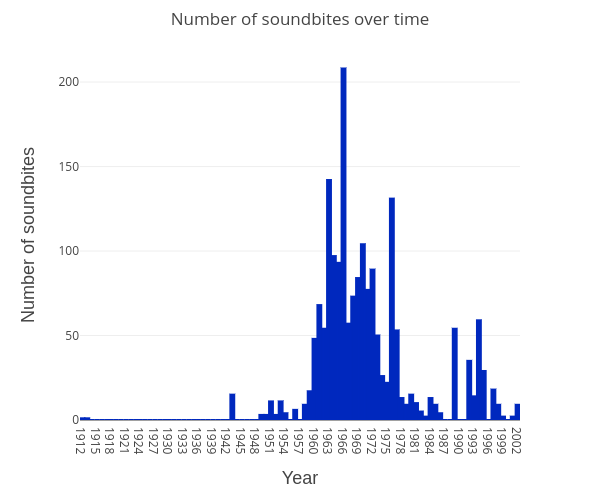 Via the Media Suite, the entire Soundbites collection (as provided by the Meertens Institute via its harvesting (OAI-PMH) endpoint, consisting of over a thousand hours, or six weeks of non-stop listening (*) and 2,466 records (as February, 2019), can be accessed. What years does the archive cover? The collection started to be compiled at the Meertens Institute from 1950. The period covers approximately thirty years: 1950-1980. How often is the data updated in the Media Suite? This is a closed collection, no longer updated by the content provider. It was made available via the Media Suite in 2016, and reindexed in November, 2018. What kind of media is included? Audio recordings and images (transcripts). The transcripts' metadata is included with the audio recordings in the Media Suite, but the images/transcripts are not yet viewable (February 2019). What portion of the collection is digital? All the items available in this collection are digital. Does the collection include enrichments? No automatic enrichments have been applied to this collection. How to search in this collection? To search the content of this collection, use the Media Suite’s Search tools.